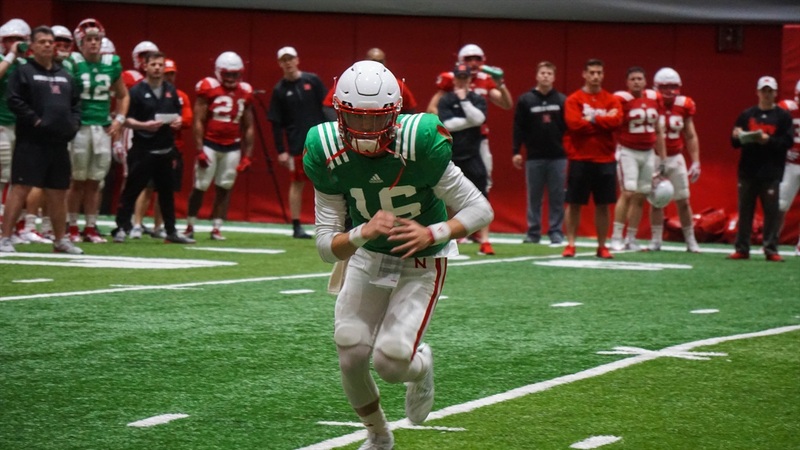 Nebraska opened up spring practice to the media for the first time Tuesday and, yes, the tempo was as advertised. Everything felt like it was dialed up a smidge. Cornerback Eric Lee Jr. and wideout Justin McGriff went hard at each other blocking in an 11-on-11 drill; Lee got his hands up in McGriff’s facemask and the receiver skipped away clapping in Lee’s direction. Nothing like the sweet sound of colliding shoulder pads in the morning. Linebacker Collin Miller forced a fumble and the defense went crazy. Wideout Stanley Morgan Jr. and guard Jerald Foster were emotional hype men when the music blaring through Hawks Championship Center cut. Here are a few more observations from the 30-minute window. >> Running backs Tre Bryant and Greg Bell were both spectators for practice. Neither was sporting any kind of brace or sleeve or cast anywhere. We know Bryant is out while he recovers from the knee injury last season, but Bell might just have had the day off for rest. Mick Stoltenberg also wasn’t suited up to practice but was still heavily involved as a pseudo-coach. When the Huskers broke into position-specific drills after 11-on-11 work, Stoltenberg was instructing the group of defensive linemen. Linebacker Sedrick King also sat out practice. Center Michael Decker wasn’t in pads like his teammates but did take a few snaps during quarterback drills. Cole Conrad, Nebraska’s other center, was in pads but didn’t participate in the 11-on-11 work. >> Along with pretty much everyone else, I kept a close eye on the quarterbacks. Patrick O’Brien stood out first and foremost. His arm strength is well-documented, but I was impressed with the confidence the redshirt sophomore seemed to exude. His footwork looked good, deep balls were on a rope and short passes were right on the numbers. He looked good. So, too, did walk-on Andrew Bunch. Bunch has quietly been garnering praise from this new coaching staff for his work in practice and I could see why Tuesday morning. The footwork in drills looked solid and he possesses the same kind of dual-threat ability that Tristan Gebbia or Adrian Martinez has. He’s changed numbers from 16 last season to 17 this season (Noah Vedral has taken 16) and there was a play during 11-on-11s where his pocket broke down and he managed to escape, evade and pick up 5 yards before being downed. It looks like Bunch has added a bunch of muscle (sorry, had to) to his frame; he looks bigger and stronger. It’s also not new information but it’s worth pointing out: Gebbia’s release is lightning fast. He was on target with most of his stuff and everything had a zip to it. Martinez started a little slower than the others. On several early throws, he was low or behind but he picked it up as things moved along. It was 7:30 a.m. after all and last night’s NCAA National Championship didn’t start until 8:30 p.m. (What was that about?) Anyway, Martinez has gotten strong reviews from the coaching staff in working back from an injury that cost him all of last year and physically he looks the part. It’s important to not get too caught up in the early stuff, this figures to be a lengthy quarterback competition. With that being said, during drills Martinez and Vedral worked in one pairing while O’Brien, Gebbia and Bunch worked in another. When the full offensive unit took the field to run through plays, Gebbia was the first man up along with Morgan and Jaevon McQuitty out wide, JD Spielman in the slot and Mikale Wilbon at running back. Redshirt freshman Hunter Miller manned the center spot, with Foster and Tanner Farmer at guard and Brenden Jaimes and Matt Farniok at left and right tackle. >> On the defensive side, Peyton Newell got work in the middle with the presumed first team thanks to Stoltenberg’s absence. He was flanked by Khalil Davis and Freedom Akinmoladun on the line, Alex Davis, Dedrick Young II, Will Honas and Breon Dixon at linebacker, Dicaprio Bootle and Lamar Jackson at cornerback and Aaron Williams and Antonio Reed at safety. Ben Stille, Carlos Davis and Deontre Thomas were the next men up on the line (with Davis in the middle). Tyrin Ferguson, Mo Barry, Avery Roberts and Pernell Jefferson were next up at linebacker. Redshirt freshman Ethan Cox and Lee were the next corners up, with Deontai Williams and Marquel Dismuke taking the two safety spots. >> Even the stretching drills and the warm-up lines seemed faster than they were last season. Tempo, tempo, tempo. Like players have said throughout the past week, there wasn’t a ton of coaching minutia being done in-between plays during the 11-on-11 work. There was time to sub guys in and out on defense but that’s about it. >> That hype-up moment I mentioned earlier with Foster, it was pretty cool. The Huskers were lined up across the field clapping, synced up to some music playing through the speaker system. When the music cut, the clapping continued as Foster led a "No Music" chant to the same beat. Then there was a whistle and everyone dropped their butts, shuffled their feet a few times on strength coach Zach Duval's count, then huddled up in the middle of the field. And this wasn't before practice started, this was in the middle of the 30-minute window the media got to see. It was interesting. Each of the coaches on this staff has said practice will be fun, this seemed like one of those small little things that breaks up the work and keeps guys' energy up. We'll have more to come throughout the day.